Holiday sparkles and fancy clothing might make a splash at the party, but leaving behind a trail of glitter isn’t a big hit with anyone. Keeping glitter on fabrics is a challenge that must be addressed with each wearing or use of the glitter-adorned fabric. 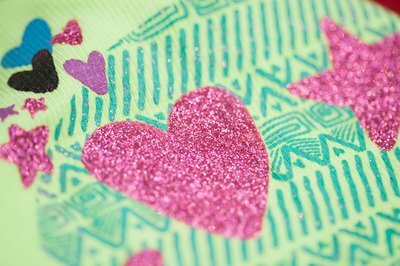 Most fashion glitter is applied to fabric with an adhesive and is not a part of the fabric fibers, allowing time and wear to release the glitter so it falls from the clothing or fabric home décor object. Take the fabric article with the adhered glitter outside and shake vigorously to remove any loose glitter. If the glitter is already loose, nothing will stop it from falling off, so removal of this glitter is in your best interest. 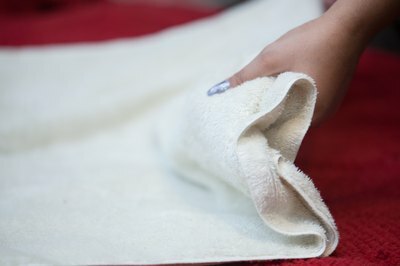 Place a towel on a bed or other flat surface to protect the surface from the hair spray. An extra bed sheet will also work to protect the surface beneath from the stickiness of the hair spray. Place the glitter-laden fabric on top of the towel. Spread out the object so it is flat. 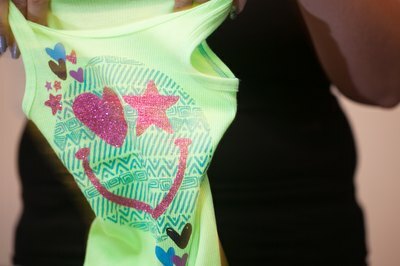 If your fabric that contains glitter has sleeves, spread them out flat with no creases. If your fabric article has zippers or buttons, fasten all closures as if you were wearing them until you are finished applying the hair spray to the glitter area. Hold a can of aerosol hair spray, any brand or hold capacity will suffice, about 10 inches from the glitter area of the fabric article. According to Robbie’s Handy Household Tips, “Spray with aerosol hair spray to make it stay put.” Hair spray is an adhesive used to hold hair in place. Lightweight glitter will be “glued” to the fabric surface for the time being by the hair spray. You will need to apply hair spray to the glitter every time you wear the article, or every time you use the household décor object. Depress the can nozzle and spray the glitter with hair spray. Allow the hair spray and glitter fabric to dry. Put on the garment as usual or place the home décor object where desired. According to Robbie’s Handy Household Tips, “Wash separately from other clothes, or at least wash it inside out if you must wash with other articles of clothing.” Friction within the wash machine caused by water agitation and other clothing rubbing against the fabric can cause the glitter to loosen and fall off. Washing inside out minimizes contact with other fabric articles. Store fabric adorned with adhered glitter in plastic bags to keep glitter from falling off and spreading around your closet and/or house and other clothes. Use caution around hair spray, as it is flammable. Can Glitter Glue Be Used on Fabric?